The progress of medicine is a remarkable thing. There was a time when doctors couldn’t fully map the human body, and a time when drilling a hole into a patient’s skull was a genuine medical procedure; now we've mapped not just the human body but the human genome, and can use magnetic resonance imaging (MRI) to see the real-time, inside workings of the human brain without lifting a scalpel. Meanwhile we’re at a turning point in terms of how technology is defining our lives. From smart homes and smartphones, to fitness trackers and self-checkout counters at supermarkets, tech plays a part in more and more aspects of our day to day existence. Yet health care seems to be the one area where the experience is still distinctly human. The idea of going for an appointment with your doctor and being met by a robot feels like the scene from Star Wars where Luke gets his new hand, but the reality is that such a scenario could be closer than you think. British medical tech firm Babylon recently launched a trial chatbot to serve as a partial replacement for the UK National Health Service’s 111 phone service. This is a non-emergency line staffed by people with no formal medical training, where callers are led through a series of questions in order to ascertain which type of professional medical assistance they need. The 111 service is valuable in that it limits the number of patients with non-urgent complaints turning up at hospital emergency rooms, but the service is expensive to run. The Babylon bot gets users to answer a series of multiple choice questions, and the process takes a fraction of the time of a phone call, saving the user time and the NHS money that can be better spent elsewhere. Obviously there’s quite a difference between a chatbot deciding which type of doctor you need and a medical professional diagnosing an illness, but according to the Financial Times, Babylon is making progress in this field too. “We already have a machine that can diagnose the majority of primary clinical conditions, so the next step is to get it clinically certified by the UK’s Medicines and Healthcare Products Regulatory Agency, and the US Food and Drug Administration,” said Ali Parsa, the chief executive of Babylon. The company has pledged to put $60 million into funding the development of its AI doctor. What form this will take is unclear, although given that Babylon currently has a successful app that allows you to have video consultations with doctors, the AI doctor could potentially be entirely digital. The question is, would you trust an AI doctor? TechRadar recently attended the British awards ceremony for developments in health tech, Health Tech & You, and spoke to several of the finalists about the future of health. What’s interesting is what happens to the data collected by the uMotif app. It’s shared with doctors and researchers, who can pool it with data from other patients to provide a better understanding about the condition. The way Hellman talks about it, doctors asking how your symptoms have been over the course of the month since your last appointment is a vastly inefficient system; being able to track symptoms in real time helps you to not only track your own progress but fosters a better understanding of your condition, enabling you, and others with the same condition, to get more effective treatment. This falls in line with the general principle that seems to run through all the Health Tech & You finalists: data is key. And nowhere are we more dependent on machines than when dealing with data. According to a recent report by the UK national academy of science The Royal Society, 90% of the world’s data has been created in the last five years, and machine learning is the only feasible way to process this deluge of data. And symptoms aren’t the only thing being tracked. Another of the award winners, Affinity, is a device for cancer patients that uses a fingerprint scanner to measure red blood cell, white blood cell and platelet counts to assess their susceptibility to infection during chemotherapy. And sepsis is a serious deal, between 1999 and 2014, a total of 2,470,666 deaths were reported in the United States in which sepsis was a factor according to the US Centre for Disease Control and Protection. Not only could Affinity be potentially life-saving, it could also save a lot of money. At present, one in five cancer patients in the UK has their treatment delayed because of their blood count being too low. These delays are currently costing the NHS £35 million (about $45m, AU$60m) per year. In countries where users pay for their own healthcare, this could be game-changing. All of these apps are amazing at helping those that have already become ill and been diagnosed, but what about trying to prevent people getting to that stage? According to a recent study from Stanford University of Medicine, fitness trackers could soon be fitted with all the biometric sensors they need to detect the onset of infection. By measuring our heart rate, temperature, and other key indicators, our mobile devices could notice deviations from the norm and alert us to the fact that we have an infection before we become symptomatic. This could dramatically alter the way we treat illness, greatly improving outcomes by catching conditions earlier. The doctor behind the study was wearing a series of biometrics monitors while on a plane and was able to identify that he was in the early stages of Lyme disease because of his biometric readings, which is seriously impressive. Apple, meanwhile has applied for a patent for an Apple Watch strap that contains modular sensors, including a blood glucose sensor for diabetes tracking and other biometrics sensors. There’s no guarantee that it’ll see the light of day, but CEO Tim Cook getting spotted with a glucose sensing prototype on his wrist means that Apple is definitely working on the tech. Chatbots are one thing, but being operated on by an actual robot still seems like a terrifying idea. However, there can be real benefits. As we reported recently, an optical surgery robot has recently passed clinical trials, beating the human surgeons in the control group while operating on retinal membranes at the back of the eye. The precision needed for this delicate surgery means a human hand can be moved a dangerous amount by something as incidental as the surgeon’s pulse. Using the robot means improved safety, and greater precision. At the moment there’s still a human surgeon operating the robot, but such developments do raise interesting questions about empathy. 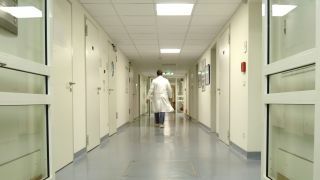 You might think it’s a given that a doctor needs to feel empathy for their patients but in his book The Psychopath Test, Jon Ronson claims that surgeons who lack empathy aren’t negatively affected by their feelings, and so perform better. So could we actually be better off being operated on by someone – or something – with no empathy? We don’t have the answers to these kinds of ethical questions yet, but on a more practical level, one thing we do know is that apps and devices have access to more and more of our health data, cyber security will increasingly become a concern. As we saw recently with the ransomware attack on the UK NHS, the greater our dependency on computers, the greater the risk that malicious actors will seek to exploit that dependency.. The risk is twofold. First and foremost, our personal safety is at risk if the devices we depend upon are compromised, but secondly, our medical information is valuable, both personally and financially. The NHS has been in hot water recently for sharing the medical data of 1.6 million patients with Google's machine learning company DeepMind, to help with the development of its app The Streams, which can detect if a patient is suffering from a life-threatening kidney disorder. The NHS can technically share our medical information without permission, if it’s for the purposes of direct care. Where things gets complicated is if a company, like DeepMind, could financially benefit from that information. According to Digital Trends, "a representative from DeepMind has reiterated that none of the information shared with the company would ever be used for commercial purposes, or to further Google’s products, services, or ads". But these distinctions can be difficult to draw. While the app is clearly being used for good, if the company makes money from being the industry leader in machine learning in medicine, is it not then using the information that’s been shared with it for commercial purposes? If the idea of all of this automation feels like it’s at risk of dehumanizing us, don't worry, there are also developments in health tech that are designed to bring people closer together too. HealthUnlocked, another of the winners at the Health Tech & You awards, is a social media app that enables people with particular conditions to join communities offering peer-to-peer support. Last year 40 million people visited the platform, and it’s revolutionized the lives of many users. HealthUnlocked estimate that 70% of people using the app haven't previously met someone with the same condition as them, so being able to discuss their illness with a community of people they can relate to, from diagnosis, through treatment, all the way to living with their condition for an extended period, can be hugely beneficial. As with most developments in technology, the big breakthroughs in health tech are likely to combine human ingenuity – and empathy – with machine efficiency. And while it may be a long time before robots and other devices can truly replace doctors, technology is already dramatically changing the way we think about healthcare.